Anticipation continues to build for members of the Class of 2011 as their May 15 graduation nears. Austin College President Marjorie Hass will present diplomas to more than 315 graduates, include 17 Master of Arts in Teaching students, in Commencement exercises Sunday, May 15, at 8:30 a.m. on the Clyde L. Hall Graduation Court on campus. 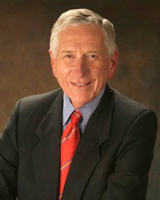 Business leader and philanthropist Drayton McLane, Jr., chairman of the McLane Group and CEO of the Houston Astros Baseball Club, will present the Austin College Commencement address. Having made it his goal to base his endeavors on moral ethics and Christian values, he has received many awards and honors for his professional accomplishments as well as his service to a variety of community and educational organizations. 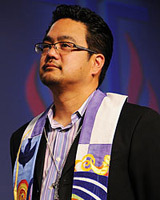 Baccalaureate services will be held Saturday, May 14, at 7 p.m. in Sid Richardson Center of Mason Complex, with the sermon presented by the Reverend Bruce Reyes-Chow, moderator of the 218th General Assembly of the Presbyterian Church (USA) from June 2008 to July 2010. He is the founding pastor of Mission Bay Community Church, a young and growing congregation of the Presbyterian Church (USA) in San Francisco, California. The Baccalaureate service also includes numbers by Austin College choral musicians. During the Commencement exercises, McLane and Reyes-Chow will receive honorary doctoral degrees, along with Ernesto Nieto and Gloria de Leon, founders of the National Hispanic Institute (NHI), which provides Latino young people with opportunities to envision themselves as future community leaders. NHI has a long association with Austin College. The weekend also will include the Golden Anniversary reunion for members of the Class of 1961 and all previously recognized classes of Golden ’Roos. Reunion activities begin Friday, May 13, and conclude with Commencement celebrations.